Jody is best known for her signature pottery designs, carved in beautiful scenes against a dark brown background. To create her pots, Jody Naranjo digs her own native Santa Clara clay and then utilizes the coiling process to form each vessel. Jody then decorates her pottery by polishing and using scraffitto where she etches or scratches through the fine slip surface of the piece in order to reveal the contrasting colored clay below. The resulting pieces are dynamic and remarkable! Look, for example, at Jody Naranjo’s vase entitled “Tall Dark Crazy Horse” where horse and rider seem almost to be flying along. 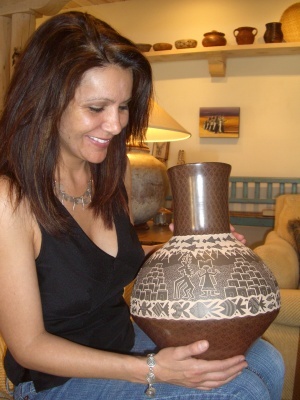 In other vessels, Jody’s design interest turns to depicting a rich southwestern cultural life. The Jody Naranjo jar "Southwest Churches" illustrates a simple, yet elegant church in rural New Mexico with a historic American Indian pueblo nearby and a river in the foreground framed by high mountains. Recently, Jody Naranjo’s artistry, its powerful exuberance, has begun to flow in an entirely unexpected direction, that of ceramic folk art animal figures. Jody Naranjo’s adorable animals are just full of fun wit and personality. For Jody, her animal figures are a much-needed psychological release from the intense focus and effort that her more traditional pieces require. “The Classical Musician,” Jody Narano’s penguin figure, in his formal black tails and red bowtie, can’t help but put an instant smile on your face. 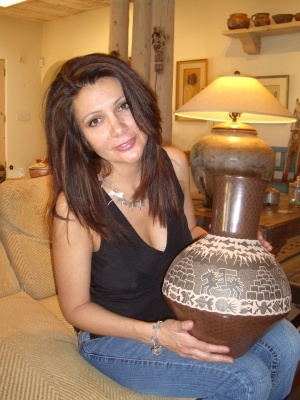 There is nothing else in contemporary Southwestern American Indian pottery like Jody Naranjo’s folk pottery pieces.